Ragnar Nordby took his graduation degree by developing a womans bunad just for Vestfold. For ten years he traveled around the county and talked with older folks to find the background information. In cooperation with Larvik and the surrounding district’s Home Craft Society he was able to present this bunad in 1932. It was in use until 1956, and at that time underwent revisions that led to another model of the Vestfold bunad. This 1956 bunad was influenced by the look of other bunads from that time period, and used the various different fabrics, some of better quality than wool, which were then available. Hulda Garborg spearheaded these revisions. The 1932 version was taken into use again in 1992, and today both versions are in use as bunads for the Vestfold district. The 1932 version of bunad should be made as a simple dress without an apron, the garment should be home produced. The bodice and skirt should be made of the fabric, and be of the same color. Today both skirt and bodice are made in black or blue cloth. 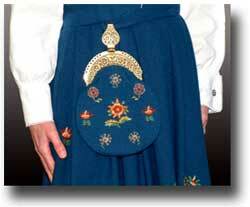 An unattached pocket/purse is made of the same fabric as the skirt and has wool embroidery of many colors. The motif of the embroidery “Vestfoldsrosa” is taken from rosmaling which was found on an old chest. The cape is black or blue and is the same wool cloth as the skirt. The neckband can be in the same color as the cape, but often a red band is used with a black cape and a green neckband is used with a blue cape. 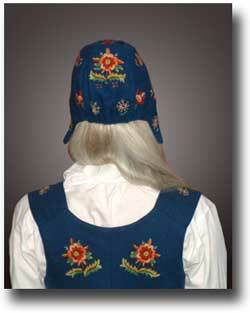 The cap is the same wool as the skirt with the same old rosemaling embroidery as that on the purse. The cap has an edging of the same color as the neckband of the cape. The belt is wool, with a silver buckle. It is woven in flat weaving after an old pattern. The pattern originates from Hold in Hvarnes. A band of the same woven pattern is used on the bottom skirt. The Jåbergs blouse is a copy of a brides blouse from Jåberg in Tjølling. It is made of thin, white linen with its signature pattern of white embroidery. The silver of the Vestfolds bunad should be a bit oxidized. There are many alternatives for the brooches. Inherited silver can also be used. The front of the bodice is laced with a silver chain. A red petticoat is worn with this bunad, as well as white hose, and black shoes with silver buckles. This information was taken from Norske Bunader Utgitt av Husfliden 1998, and translated by Vicki Nelson.